Saxe is a fluid world with an oceanic geography of a liquid other than water such as ammonia, methane, hydrocarbons, or other exotic liquids. The system has a population between 10,000 and 10 million, lacking the industrial base to be completely self-supporting. 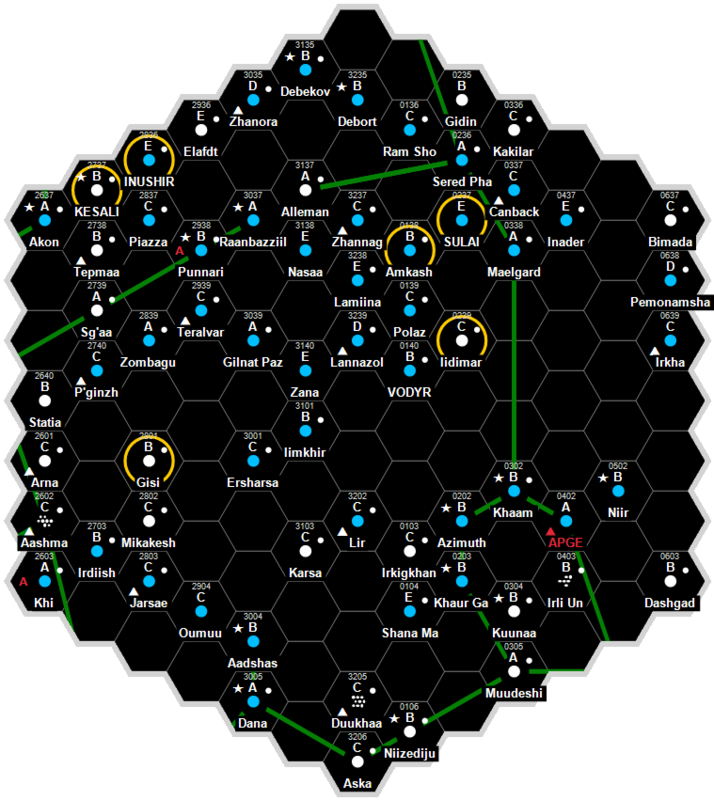 It is a Human dominated Non-Aligned world in the Five Sisters Subsector of Spinward Marches Sector. The entire population lives in an ancient TL–16 submerged city floating in the worlds largest ocean. The outpost was originally established, according the few records that survived the Maghiz on Daryen, to study the beginnings of life on this nascent planet. Stranded, the population eventually lost most memory of their homeworld, except for a few scraps of Daryen culture and ideological underpinnings, which eventually became a quasi-religion based upon rote recital and ritual. Fortunately, their TL16 machinery proved exceptionally reliable, requiring only repetitive maintenance practices to keep running. Unfortunately, the loss of knowledge would not allow the construction of new machinery, nor prevent major catastrophes. That the colony survived as long as it had is a testament to Daryen engineering prowess. Saxe is populated by the remnants of a Pre-Maghiz Daryen scientific outpost. The Third Imperium did not contact Saxe until 308, and literally stumbled over the inhabitants. The Imperium's low TL (12-13) prevented them from offering much in the way of technical assistance, and there was much debate within IISS over the world's disposition in relation to both the Imperium and the Darrian Confederation. In the end, an IISS contact team was permanently stationed in the city to observe but otherwise not interfere with the inhabitants. The Daryen Confederacy also posted a team of advisers to the planetary government early on, but friction with the locals led to its recall, and the Confederacy largely ignored them until the Collapse. The IISS teams observed the progressive deterioration of the city, and by the Fourth Frontier War, the Scouts had made contingency plans for evacuating the population in case of a widespread life support failure. But the events of the Post-Collapse period actually saved it. Or as one scout official put it, damned by one disaster and saved by another. Two trends rescued the colony: the Regency's advancement to TL–16, and the Daryen Renaissance. Over the last 50 years, Regency and Daryen engineers have figured out and managed to refurbish or replace many of the city's failing systems. The landing pad on the cities upper hemisphere has been expanded into a full starport, and there is no talk of either expanding the facility or of replacing with a larger facility of new construction. The people of Saxe had long cultivated a blasé attitude towards their predicament, a benign unwillingness to delve further into the unknown of their own environment. This attitude was further reinforced by the inability of Antebellum researchers and engineers to understand the city. But the increasing capacity and confidence of the Regency and Daryen teams rebuilding the city has collapsed that indifference. Technical schools have been established with Daryen assistance, and there has been a resurgence of study in Daryen culture among the young. Older Saxians still cultivate passivity among themselves, but have been instrumental by encouraging their children to obtain an education and leaving behind the "bubble" mentality that has long retarded the world. ↑ Martin Dougherty, Neil Frier. Behind the Claw (Steve Jackson Games, 1998), 52. This page was last modified on 3 July 2016, at 20:47.